Just as schools release student report cards to track progress, so the school district and its schools also receive report cards published by the Oregon Department of Education. ODE released those report cards this fall for the 2017-18 academic year. The "At-A-Glance" report, pictured here, and also available on the district's website here, provides a quick look at the district's overall performance, attendance, demographics and more. 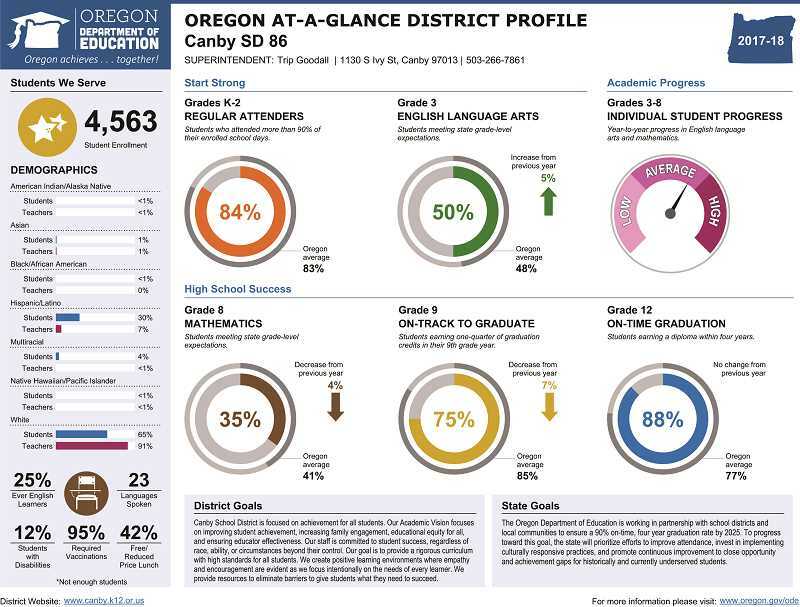 Canby's grades are looking good, with just two highlighted statistics falling below the state average—the grade 8 math performance and the grade 9 on-track to graduate percentage. According to Superintendent Trip Goodall, ODE erroneously published the district's on-track to graduate rate at 75 percent, which would be down by 7 percent from the previous year. However, the high school's report card shows the on-track to graduate rate accurately at 83 percent, which is actually 1 percent up from last year. Still, the correct statistic is 2 percentage points below the Oregon average, and the district is working to improve it. One way it plans to do that is by providing supports for struggling students earlier through the "Cougars Achieving Together = Success" intervention program for ninth grade students. "We have a high school success team dedicated to improving student achievement," Goodall said. "Our CATS program now supports ninth grade students who struggled in middle school. Previously, this additional support began once a student failed at class at CHS. We have Measure 98 dollars dedicated to improving our graduation outcomes." Despite the on-track to graduate rate falling below the state average, Canby's actual on-time graduation rate, at 88 percent, continues to sit well above Oregon's, which is 77 percent. Goodall said the district is taking several steps to keep that rate high, including working to make instruction culturally relevant and engaging in equity work, which ensures, he said, "that students in historically underserved populations receive the support they need to level the playing field." Unfortunately though, it appears mostly teachers who are listed as "white" will be doing that cultural and equity work, with ninety-one percent of teachers listed as "white." Of the district's 4,563 students, the report shows that 30 percent are Hispanic/Latino, but just 7 percent of the district's teachers are Hispanic/Latino, a discrepancy the district is working to improve. At the October school board meeting, District Director of Human Resources Michelle Riddell reported on the demographics of new hires, noting that in the 2017-18 year, 20 percent of new hires were persons of color; and then in the 2018-19 year, 25 percent were persons of color. "We are actively working to recruit and retain teachers of color to more accurately reflect our diverse population," Goodall said. One big determinant of future student success is how frequently students attend school at a young age. 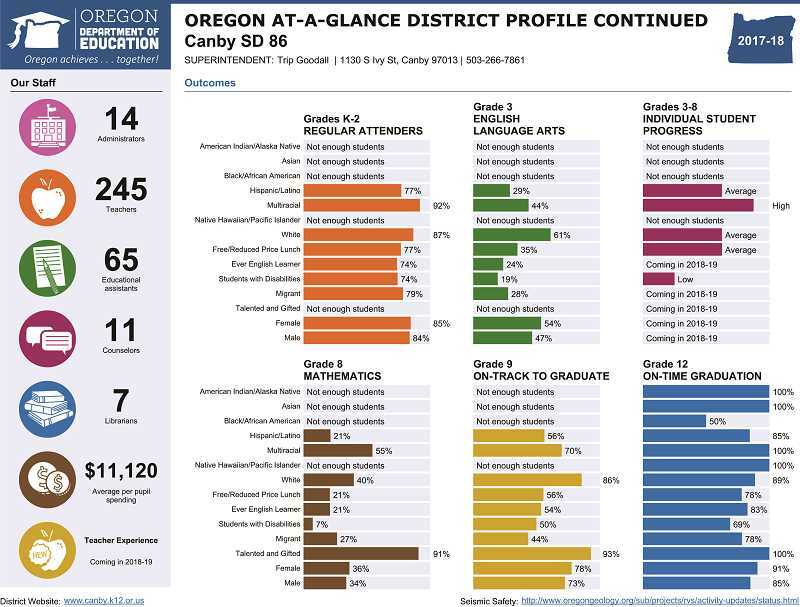 The report card shows that 84 percent of Canby's students in kindergarten through second grade are regular attenders—students who attended more than 90 percent of their enrolled school days. This is 1 percent above the Oregon average. ODE is focusing on addressing chronic absenteeism, and Canby School District is following suit. The district has been sending home the message to parents, Goodall said, that regular attendance has an impact on student achievement. Lee Elementary has even began keeping daily attendance stats to keep everyone in the school accountable. Goodall noted in a letter to families that the district already knew from assessment data that Canby has room for improvement, and he promised continued effort to improve. "We will continue to work to improve the educational experience for all of our students," Goodall said in the letter. "Canby is a community that believes strongly in its youth. As a school district, we are committed to providing our very best for every student and family." If any person has questions about any of the data, Goodall encourages them to speak with their school's principal.